This graphic poster was created to help the students visualize the kinds of maps they can create using ArcVoyager. Montserrat, a territory of the United Kingdom, is a volcanic island located in the Lesser Antilles, southwest of Antigua in the Caribbean. It is approximately 12 miles long by seven miles wide, approximately 39 square miles in land area, and located at latitude 16'45"N, longitude 62'10"W. Montserrat, known as the "emerald isle of the Caribbean," is a picturesque, rugged island characterized by mountain peaks and lush green tropical rain forests with a diverse and interesting flora and fauna. Its people are open, warm, and friendly. This tropical island paradise and the people living there have been affected by catastrophic volcanic eruptions since July 18, 1995. These eruptions destroyed the capital city of Plymouth and rendered the southern half of the island an exclusion zone. The population of the island has dropped from 12,000 residents before the eruptions began to the current population of approximately 4,000. Rebuilding efforts are underway in the northern safe zone, where the population now resides. Although volcanic activity has interrupted the lives of the residents, they continue to live in their changing world with poise and dignity. 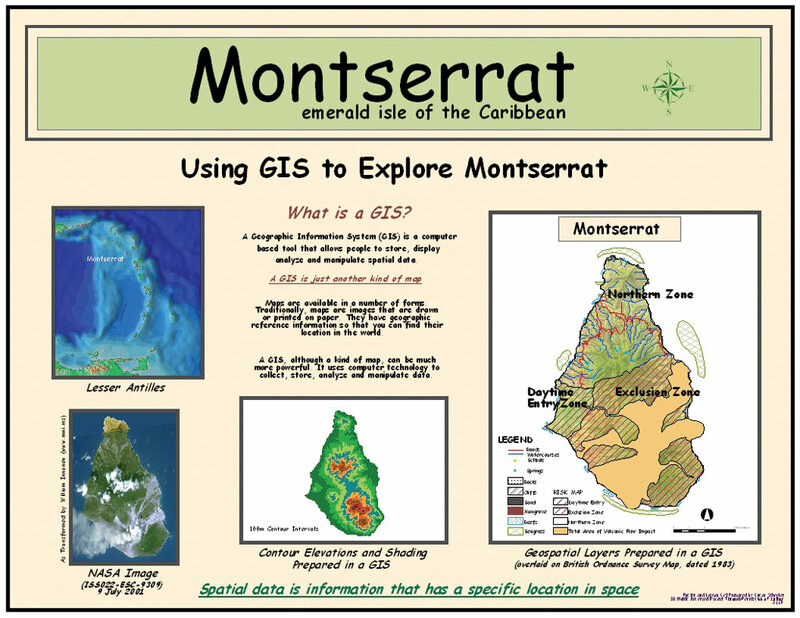 In December 2002, Susan Wheeler, a consultant in land development and GIS from Pennsylvania, went to Montserrat to introduce ArcVoyager software in the classroom at both the primary and secondary levels. ArcVoyager is a GIS teaching aid created by Esri's Schools and Libraries team to be used by elementary teachers, middle school students, high schoolers, librarians, college instructors, museum professionals, or parents. This project was developed in conjunction with the CALIPSO volcano monitoring project, sponsored by the National Science Foundation, the United Kingdom's Natural Environment Research Council, and the Montserrat Volcano Observatory. A set of six lessons was developed to teach basic geography and basic GIS skills. The lesson sets ranged from introducing GIS and its uses to exploring world and Montserrat data sets through ArcVoyager. Before traveling to Montserrat, Wheeler built georeferenced digital data sets of Montserrat in ArcView 3.x so the lessons would have real life value for the students. This was done by scanning the British Ordnance Survey (1983) tourist map, then warping and georeferencing it. Once this basemap was made, the boundary, road, and watercourse layers were produced. The purpose was to use this data set in ArcVoyager. There are four schools in Montserrat. Three primary schoolsLookout Primary, Brades Primary, and St. Augustine'sinclude kindergarten through grade 6. There is also one secondary school known as Montserrat Secondary School. The educational system in Montserrat is based on the British educational system. Wheeler visited each school to install ArcVoyager software in the computer labs. At the primary grade level, lessons introduced GIS and explored the ArcVoyager software. The developed lesson set showed the Leeward Islands with the location of its volcanoes and the location of tectonic plates. The students were very excited to explore Montserrat in the context of the island arc and see how the volcanoes are related to tectonic plates. They were also very interested to learn that many volcanoes exist worldwide, and they were able to relate this information to their own environment and experiences. The primary students also followed a tutorial designed to introduce and explore the Montserrat data sets. The students learned how to add themes to a view; change the order of the themes; modify themes using the Legend Editor; and use various buttons on the toolbar such as Identify, Find, Query Builder, Zoom to Full Extent, Zoom to Selected, Zoom In, Zoom Out, and Pan. 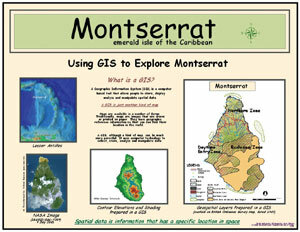 In the Montserrat Secondary School, a workshop was held for the geography teachers to explore ArcVoyager as a geography tool and to follow the developed lesson set. Their students were exploring the same lesson sets as the primary grade students, but have a greater ability to work online. The last lesson in the lesson set gives the students direction on how to access various free digital data set downloads from the Internet, explore tutorials from various educational Web sites, and build their own GIS projects. The 1983 British Ordnance Survey map, which was used to create the digital data sets, was produced before the volcanic activity began in 1995. The British Ordnance Survey is currently completing a mapping project to produce a new map for Montserrat, which should be available by the end of 2003. The first digital basemap Wheeler prepared for the students showed the island without any of the volcanic impacts. It became very apparent, when working with the students, that their knowledge base is predicated on their own life experience. There has been continual volcanic activity for eight years, and most of these young students only know the island as it exists with an active volcano. To make the lesson set relevant, Wheeler prepared additional lesson sets and sent them to the teachers to show the hazard zones, the areas of volcanic flow impact, and more detailed information about the northern safe zone. She modified the lesson set to give more complete data about the areas that are now inhabited and less data for the exclusion zone. While in Montserrat, Wheeler met with the local director of the British Ordnance Survey office and GIS professionals from the local Physical Planning Unit (PPU), which is part of the government of Montserrat. The purpose of this visit was to collect existing cadastral mapping data of a newly developed neighborhood and use it as part of the lesson set for the students. Jo-Ann Burke of the Lands and Survey Department and Jerome Meade of the Physical Planning Unit shared their data about the new neighborhood. This made it possible to add an additional lesson that shows a specific, newly developed neighborhood. The production of the base set of maps was completed with the aid of Beth King, an instructor for the Pennsylvania State World Campus Certificate Program in GIS. Pennsylvania State offers the GIS Certificate Program entirely online to meet the needs and busy schedules of full-time professionals. Wheeler has developed a relationship with the Montserrat teachers so they can get online help by contacting her if problems should arise as they integrate the use of ArcVoyager and the Montserrat data set into their social studies curriculum. For more information, contact Susan Wheeler, GIS consultant/project manager, 377 Hylbert Road, Boalsburg, Pennsylvania 16827 (tel. : 814-466-6697, e-mail: oovilu@hotmail.com).